Take a look at the security updates, bug fixes, and other changes to the operating system with Apple's recent iOS 11.0.3 release. Apple has released its latest version iOS11.0.3 on October 11. It is the Apple's third recent update since the release of iOS 11 to its users last month. This version is promised to be backward-compatible with the prior release. However, it mainly addresses two issues that some users were facing while other several issues have not been addressed that were reported by users. Apple iOS 11.0.3 major promised capabilities include audio fixings and haptic bugs fixings. This update is of 276.6MB in size. Moreover, this update is particularly meant for iPhone 5s and above models, iPad mini 2 and above, iPad Air and above as well as the iPod touch 6th generation. Apple is currently beta testing its version iOS 11.1, which will contain many new emoji, 3D Touch multitasking gesture and the Apple Pay Cash feature. Being a point update, this version majorly offers several improvements instead of offering new features to its users. In this blog, you will find some of the key updates of iOS 11.0.3 in details along with some major updates on its previous versions. It has resolved the problems faced by iPhone 7 plus and iPhone 7 users for audio and haptic feedback issues. It has addressed an issue with iPhone 6s for unresponsive displays as they were not serviced with genuine parts. Note: Non-genuine replacement displays often compromised visual quality and may not function correctly too. Besides, there are still some issues left which company will address in its next update. This will deal with shorter battery life and text notifications issues while rebooting the device. Fixed the bugs causing crackling noises in the iPhone 8 earpiece. Fixed the issues causing photos to get hidden. Resolved the issues of attachments in S/MIME encrypted emails that were unable to open. Fixed the problem causing issues with the synchronization of Outlook.com, Exchange Server 2016 in Apple Mail and Office 365. Performance improvements in App Explorer, iMessage app Drawer, and Springboard. Click here to download its latest version. 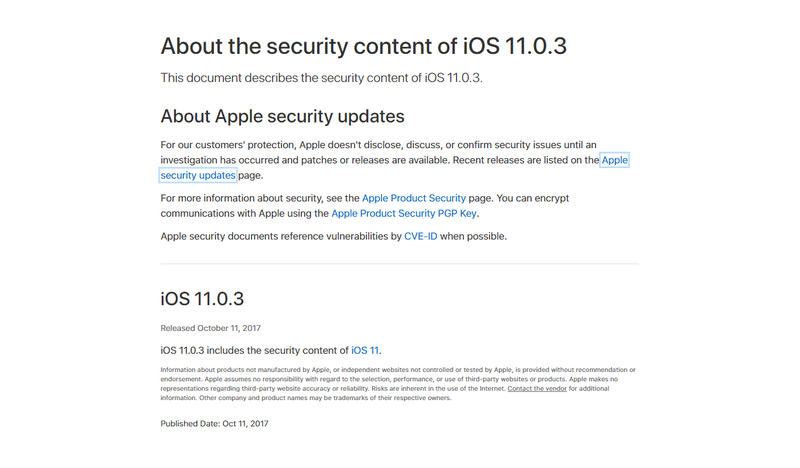 Check out the entire list of Apple iOS 11 security changelog and new additions by clicking here. 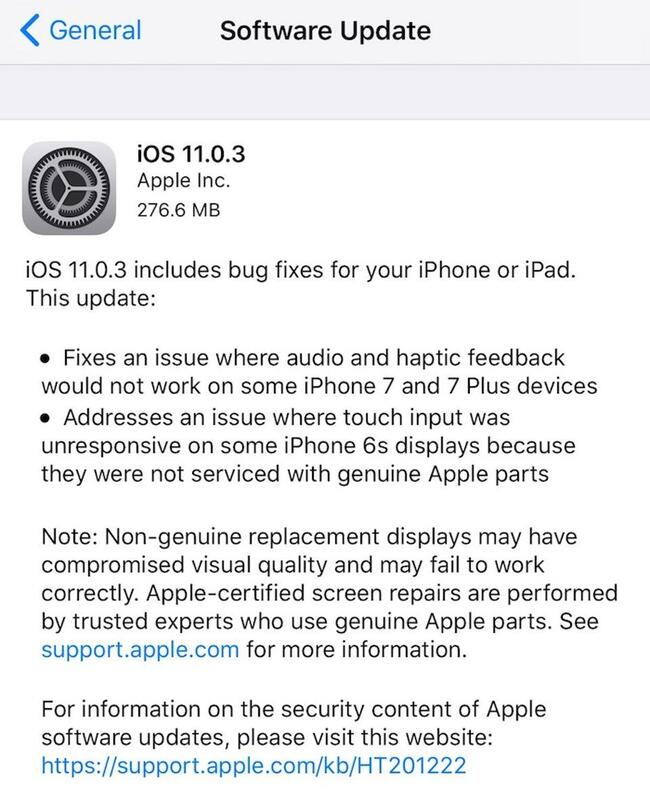 As far we have seen, Apple iOS 11.0.3 update provides you various bugs fixings for iPhone 6s, iPhone 7, iPhone 7 Plus and much more as already listed above. You might not be confused now for not upgrading to its latest version after watching the above video. In fact, you can easily install iOS 11.0.3 by performing this step:- Settings app > General > Software Update on your device or you can also update your device by connecting it to the computer and then install the update through iTunes. QR Codes: Are They Really as Dead as We Think?